Guest week continues with some long and juicy nails, and they belong to Briana at Nail A College Drop Out. So here we are. You, me, and a blog entry. Seeing that I am not the usual author here; I should—at the very least—introduce myself, right? Right! (Insert cheesy name badge they make you wear at mandatory team meetings.) My name is Briana from Nail A College Drop Out. Now that we’re better acquainted, let’s get down to the reason everyone is here. Nail art. A few months ago (and by a few I mean back In June) a friend suggested I do watermelon nails. As you can see quite a bit of time passed, but at least it got done. Can you hear the procrastination talking? For the watermelon rind nails I started with a base of Barry M Mint Green as a base. Next, I random sponged on Barry M Spring Green. Finally, I used a fan brush to apply Wet n Wild Fast Dry SaGreena the Teenage Witch. 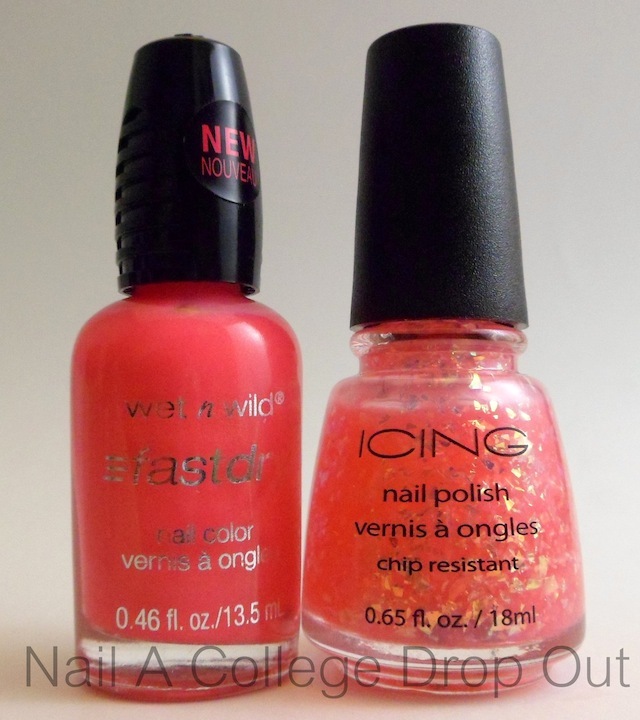 For the watermelon flesh I started with a base of Wet n Wild Fast Dry How I Met Your Magenta. Next, two coats of Icing Rave Royalty. Finally, on the thumb and middle finger, I applied some 1.5mm black studs I purchased from BornPrettyStore.com. Why did I leave the ring finger stud-less? I felt the need to go to sleep. Thus, my ring finger represents a seedless watermelon. See folks! Procrastination isn’t always terrible. Want more sarcasm and nail art? Visit me over at NailACollegeDropOut.blogspot.com and follow me on Twitter and Instagram! P.S. Thanks Katy for letting me fill in for you! Thank you Briana for the summery nails! Be sure to check out Nail A College Drop Out for more long-nail-nail-art. I bet it's quite a change for readers to see such long nails! Wait till I return guys, you'll be seeing some little nails for sure. Moving stuff out of storage will do that to a girl.